Looking for all those favorite Spring flowers rolled into one bouquet? You've found it! 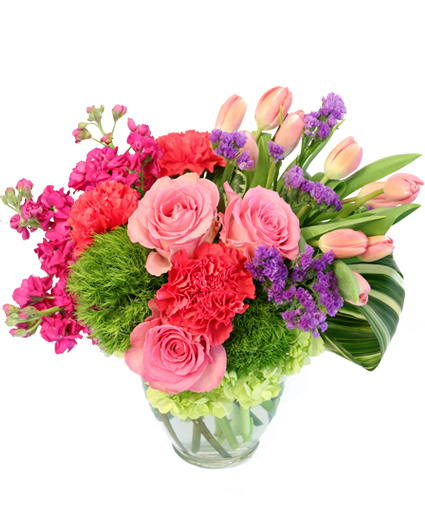 Enjoy the beauty of spring tulips, roses, carnations, and even some fuzzy green dianthus! Anyone who loves Spring will fall in love with Blossoming Medley! **Flowers, foliage and container may differ due to seasonal availability. All efforts will be made to create as similar a product as possible to item pictured. You can never go wrong when you send an arrangement that is as vibrant and full of life as she is! Lavender roses and coral gerberas are accompanied by pink alstroemeria, antique green hydrangea, coral hypericum and ornamental kale. We have the best blooms to express what's in your heart and on your mind. Order from us today! **Flowers, foliage and container may differ due to seasonal availability. All efforts will be made to create as similar a product as possible to item pictured. 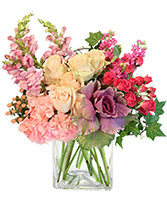 Delight in an arrangement full of soft beauty and elegance. Cream roses are cradled by blushing pink flowers, peach hypericum, and ornamental greens. Cherish them always with a delicate expression of caring and joy. **Flowers, foliage and container may differ due to seasonal availability. All efforts will be made to create as similar a product as possible to item pictured. A delicate collection of lavender and white flowers are sure to please the one you love. **Flowers, foliage and container may differ due to seasonal availability. All efforts will be made to create as similar a product as possible to item pictured.